We present a scenario wherein awake fiberoptic bronchoscope (FOB)-assisted intubation utilized for intubation in a morbidly obese patient of Cushing's syndrome was unsuccessful despite successful entry of FOB into the trachea. A 33-year-old male patient, a diagnosed case of pituitary microadenoma, weighing 108 kg, with a height of 158 cm (body mass index of 43.4) was posted for transnasal transsphenoidal decompression of the microadenoma. 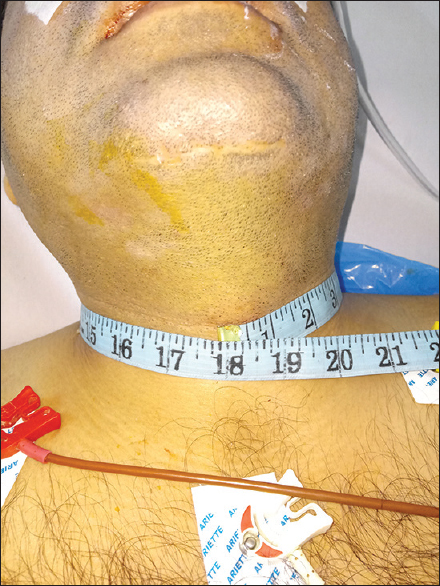 On preanesthesia examination, his airway examination revealed Mallampati Class II, a neck extension of 40°, neck circumference of 45.72 cm (18 inches) [Figure 1], a thyromental distance of 4.5 cm, and excessive submental fat. These factors were pointing toward difficult ventilation and intubation, and a plan for awake FOB-assisted intubation was made for securing the airway., The patient's airway was prepared by giving the superior laryngeal and recurrent laryngeal nerve blocks. The posterior pharyngeal wall sprayed with 10% topical lignocaine. Standard monitoring (heart rate, noninvasive blood pressure, electrocardiogram, and pulse oximetry) was applied, and the patient was started on dexmedetomidine infusion at 0.5 μg/kg/h. FOB was performed orally by an experience anesthesiologist and could be negotiated freely till carina, but when the attempt to railroad the endotracheal tube (ETT) over it was made, the patient did not allow the railroading, making the attempt unsuccessful. Two more attempts were made, wherein FOB could be easily negotiated through the vocal cords and carina identified, but each attempt of railroading the ETT over it was unsuccessful due to excessive movement of pharyngeal muscles by the patient. Since the airway was already prepared, an attempt to do awake video laryngoscopy (with Truview video laryngoscope™) was made, but due to the big floppy tongue obstructing, even epiglottis could not be visualized properly. In view of inability to secure airway, the decision was taken to reschedule the case with a fresh airway plan. There was no desaturation at any point of time and no mortality or morbidity. The patient was posted for surgery after 1 week to help settle down the airway edema due to repeated FOB attempts. The plan was to attempt FOB-assisted oral intubation after adequate airway blocks with a standby plan of retrograde intubation. Two more experienced anesthesiologists were called for help during securing of airway and induction in the operating room (OR). An instrument trolley for retrograde intubation was prepared, and a standby instrument trolley for tracheostomy was also available. ENT specialist was also present in OR for emergency surgical airway. The patient was thoroughly counseled, and airway preparations in the form of posterior pharyngeal wall spray with 10% lignocaine and airway blocks of superior laryngeal nerve and recurrent laryngeal nerve were performed for smooth conduct of awake FOB-assisted intubation. One milliliters of 2% lignocaine was sprayed on vocal cords after they were seen by the FOB. Again FOB could easily reach the carina, but when we attempted to railroad the ETT, the patient did not allow the movement of ETT beyond vocal cords, thus making the attempt difficult. The dilemma was to either withdraw the FOB and go ahead with the plan B of retrograde intubation or try intubating with FOB after administering an induction dose of propofol since the FOB was in the correct place. Intravenous administration of 150 mg propofol was given in graded doses, but again the attempt to railroad the ETT was unsuccessful due to excessive pharyngeal muscle movement by the patient. The FOB was well in place and carina was visualized so a calculated risk was taken by administering another 50 mg propofol and 100 mg of succinylcholine. As soon as the fasciculations disappeared, the ETT could be easily railroaded over the FOB and the same could be confirmed by vision while withdrawal of the FOB and by capnography. Although FOB could be negotiated easily, railroading of ETT was difficult owing to inadequate suppression of pharyngeal muscles and lack of muscle relaxation. Another method could have been to withdraw the FOB and induce the patient with spontaneous inhalational anesthesia using sevoflurane. This would suppress pharyngeal reflexes and provide muscle relaxation and subsequently intubate using FOB. A background infusion for sedation with propofol or dexmedetomidine would have been required to maintain depth of anesthesia. We wanted to report this case because this was the first time a failure to secure airway with FOB-assisted intubation was encountered by either of the three experienced anesthesiologists. We also wanted to highlight the importance of thorough planning for anticipated difficult airway and presence of other experienced team members (another anesthesiologist, ENT surgeon) to help tide over the crisis if required. FOB-assisted intubation is definitely an important and indispensable skill which all anesthesiologists should learn but even the impermeable techniques fail. Airway management in obese patients can be very tricky and requires careful planning. The idea to publish this case was not to undermine the value of FOB-assisted intubation or video laryngoscopy but to highlight that fact that despite correct performance of technique and clear visualization of carina, successfully securing the airway may become extremely difficult and diligent planning can save the day. O'Neill T, Allam J. Anaesthetic considerations and management of the obese patient presenting for bariatric surgery. Curr Anaesth Crit Care 2010;21:16-23. Dierdorf SF. The Flexible Fiberscope for Airway Management and Diagnosis of Airway Pathology. Anesthesiology News Guide to Airway Management; 2010. p. 19-24. Marrel J, Blanc C, Frascarolo P, Magnusson L. Videolaryngoscopy improves intubation condition in morbidly obese patients. Eur J Anaesthesiol 2007;24:1045-9. Rosenstock CV, Thøgersen B, Afshari A, Christensen AL, Eriksen C, Gätke MR, et al. Awake fiberoptic or awake video laryngoscopic tracheal intubation in patients with anticipated difficult airway management: A randomized clinical trial. Anesthesiology 2012;116:1210-6. Kulkarni KR, Namazi I, Madnaik S. Failed fiberoptic intubation and surgical tracheostomy in a case of down's syndrome with goiter. Sri Lankan J Anaesthesiol 2013;21:83-5. Smith MP, Khodadadi O, Doyle DJ. Use of GlideScope® Video Laryngoscope in Morbidly Obese Patients (>45 BMI): A Retrospective Review. San Francisco: Lecture presented at ASA Annual meeting 2007.